Lower Westchester Foot and Ankle in White Plains, New York, serves patients from the river to the sound. People come in from Valhalla and New Rochelle, and some even cross the state line from Stamford and Greenwich, Connecticut. Centrally located in White Plains, the office is easily accessible from all major highways. It’s also just a few blocks away from Montefiore-White Plains Hospital, where patients from Lower Westchester Foot and Ankle receive admitting and surgical privileges. The office is wheelchair-friendly and has a convenient parking lot with spaces right in front of the door. The decor is comfortable, clean, and modern, and the rooms have the latest medical technology, including digital X-rays, laser therapy, ultrasound, and shockwave therapy. We also offer seamless online scheduling for those busy patients who need to schedule without the phone call! For patients suffering from foot or ankle pain, Lower Westchester Foot and Ankle in White Plains, New York, is here to help. The staff takes the time to listen and works with patients to determine their best course of treatment so that they can return to a healthy, active lifestyle as soon as possible. Dr. Kagan is an executive board member of the American Society of Forensic Podiatry and is on the Science and Practice Subcommittee of Podiatry at the International Association for Identification. An adjunct instructor of forensic podiatry at the New York College of Podiatric Medicine, Dr Kagan has published many articles on podiatric forensics and was involved in many research projects throughout his association. Dr Kagan received his medical degree from The New York College of Podiatric Medicine, residency trained at Coney Island Hospital and is a member of several podiatric medical boards. Return to activity with available, patient and caring doctors. 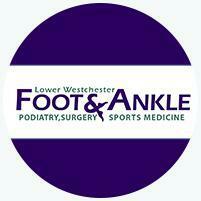 Click here to see the areas served by Lower Westchester Foot & Ankle! Here are just some of the insurance we accept. To find out if an insurance not listed here is accepted, give our office a call. For any questions about an existing bill, please call (718) 872-9258. Your insurance company can help you determine if we are in your network and if you need a referral to see us. Please contact your insurance directly to find out. It is your responsibility to know your insurance plan and how it works. We do not accept medicaid, workers compensation, no fault insurance (auto accident cases), or legal cases. "Dr Rubenstein was quite good, gave reasonable advice, quick service and was pleasant to talk with." "I also appreciated his approach to helping me - for example, not jumping right into talks of surgery, but first, trying other, non-invasive forms of treatment." "...Explained everything, and was overall a very pleasant experience, will be coming back for sure!" "...He was kind, gentle and knowledgable." "The guy genuinely cares. He took the time to figure out exactly what was wrong with my foot..."